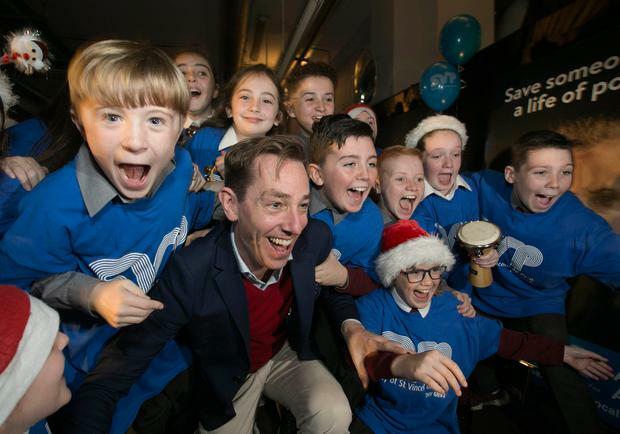 Keeping up the important tradition of giving to others at Christmas is why Ryan Tubridy finds himself involved with St Vincent de Paul's annual appeal for a sixth year running. The RTÉ broadcaster launched the campaign yesterday at SVP House, in Dublin, with a little help from the students of St Margaret's National School, Dublin, and St Joseph's Primary School, Tipperary. This year the charity, which receives 1,000 calls for help a day, is asking the public to remember the vulnerability of children at this time of year. "I was packing hampers when I was 14 or 15 in school and we were told that this is what you do at Christmas," the 'Late Late Show' host said. "It is one of those things, you hope poverty will diminish down through the years but it's still here. "In the recession and even in good times, poverty exists and that is why I am here every year." The service visited 50,000 families last winter alone. To donate, see svp.ie or call (01)8848200.